Police stand amid tear gas as they clash with supporters of opposition presidential candidate Salvador Nasralla near the institute where election ballots are stored in Tegucigalpa, Honduras, Nov. 30, 2017. Protests are growing as incumbent President Juan Orlando Hernandez emerged with a growing lead for re-election following a reported computer glitch that shut down vote counting for several hours. A second day of protests roiled Honduras Friday as the country’s electoral court began hand-counting votes showing “inconsistencies” from Sunday’s presidential election. Supporters of Salvador Nasralla, center-left candidate for the Opposition Alliance Against the Dictatorship, on Friday trucked in tires and rocks to block streets in the capital city of Tegucigalpa, Reuters news agency reported. Security forces stood guard around the presidential palace, home to Juan Orlando Hernández, the U.S.-backed incumbent who heads the conservative National Party. Authorities reported at least one protester died in unrest triggered by the unfinished count, now in its fifth day. Citing police sources, Reuters reported Friday that a man had been shot dead at a protest in the Caribbean port city of La Ceiba. Roughly a dozen members of the military and police were injured in demonstrations in Tegucigalpa, where the Hospital Escuela reported treating 10 injured protesters, Reuters added. In the northwest city of San Pedro Sula, protesters looted several businesses and set a bank on fire, the Associated Press reported, citing local press. 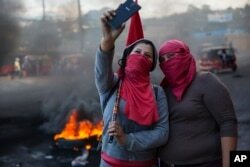 Masked supporters of presidential candidate Salvador Nasralla take a selfie at a burning roadblock set up by demonstrators protesting what they call electoral fraud in Tegucigalpa, Honduras, Dec. 1, 2017. Hernández led rival Nasralla by more than 46,000 votes as of late Thursday. Early polling had predicted Hernández would win handily, but with half the votes counted, Nasralla surprisingly had pulled ahead with a five-point lead before an interruption in the count Monday. When Hernandez pulled head, Nasralla’s backers claimed fraud in the vote count. The electoral court’s leader, David Matamoros, blamed the delayed results on computer failure. Late Thursday, he said nearly 95 percent of the votes had been counted. He also said that the hand count would be done under the scrutiny of both political parties’ representatives. The Organization of American States, appealing for calm, has urged Honduras’ electoral commission to process all ballots. Some observers fear Honduras could experience the kind of turmoil that followed the 2009 coup of President Manuel Zelaya. “It looks like the stage is set for Juan Orlando [Hernández] to be declared the winner, and the opposition is not going to take it,” Juan Carlos Hidalgo, a Latin America policy analyst for the Washington-based think tank Cato Institute, told VOA on Friday. “There’s a fertile ground for the rejection of the existing government of Juan Orlando and a belief from the beginning that there’d be fraud in the election,” Schneider observed. Schneider noted frustrating conditions “poverty, inequality and corruption” for most of the country’s 9 million residents. More than two-thirds live in poverty, according to the World Bank. “Access to services, access to education, decent housing, decent health care [don’t] exist for the vast majority of Hondurans,” Schneider said. “There is a major concern, too, about increasing authoritarianism and concentration of power in the hands of Juan Orlando,” Hidalgo said. Hernandez, elected in late 2014 to a four-year term, had contested Honduras’ constitutional ban on presidents seeking a second term, Hidalgo pointed out. He also noted that Hernandez had been speaker of the National Assembly when it ousted four Constitutional Court justices in late 2012 for voting down several government plans; with the judges’ replacements, the court in 2015 approved a president’s right to seek re-election. The Constitutional Court previously had ruled that Zelaya had taken “treasonous action” by seeking a referendum on whether to revise the constitution, Schneider noted. Now, Zelaya is the political strategist for the Opposition Alliance supporting Nasralla. Analysts Schneider and Hidalgo point out the United States has a big stake in Honduras’ stability. The U.S. has spent millions, through initiatives such as the Millennium Challenge Corp. on aid and to promote government transparency and accountability there. The Central American country’s poverty and violence has fueled migration to the United States, some of it illegal. Separately, U.S. Homeland Security is weighing whether to extend a humanitarian program Temporary Protected Status, for roughly 57,000 displaced Honduran immigrants.